The SelectAir Powered Mattress is quiet, portable, lightweight and reliable. 400 pound Capacity. MAX includes System Lock, Auto Comfort and Pulse Mode. MOXI SelectAir MAX® low air loss mattress system is a powered and adjustable mattress replacement system offering the most cost-effective alternative for skin protection and pressure sore prevention. Still lightweight and portable, the MAX had added the System Lock, Auto Comfort setting and Pulse Mode which provides three levels of therapeutic alternating pressure relief. SelectAir MAX® controls moisture with wicking action; air gently blows underneath a vapor-permeable cover, wicking moisture away and keeping the skin at a healthy moisture level. The wicking method has several benefits over direct airflow alternatives. It is much less likely to over dry the skin (a clear contra-indication to moist wound healing). It also reduces the risk of airborne pathogens, and provides additional comfort for patients who tend to feel cold or simply find it unpleasant to have air blowing directly on them. Firm mattress mode with timer facilitates nursing care during dressing change and patient repositioning. Upright Patient Mode adds support when the head of the bed is elevated so the patient can sit upright with no loss of therapeutic benefits. Foot Pillow helps to prevent unnecessary skin breakdown due to patient migration. Wicking Action allows air to escape through tiny holes on the top of the mattress, and circulates under a vaporpermeable cover, to wick moisture away from patient. Keeps Patient Cool and Dry as "True" Low Air Loss technology allows air to escape from the top of the mattress and directly interact with moisture at the patient/bed boundary. 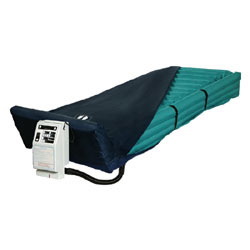 Integrated Side Bolsters keep patient centered in the bed and reduce the risk of entrapment. Quick-Change Filter is easy to access and quick to change. User-Friendly Control Unit with rapid inflation and easy set-up. Mattress Configuration: Individual baffles divided into 3 sections; head, seat and foot. Integrated side air bolsters with foot pillow. CPR/Emergency Deflate allows quick deflation of the system in case of an emergency. Unit Weight: Control Unit - 9 lbs., Mattress - 10 lbs. Fits most standard bed frames. Please reference MOXI Mattress Comparison Chart for specifications.